You are most welcome! Wish you weren’t so far away hon, you would definitely have a batch of my super secret brownies. Enjoy this year…it will never come again. I personnally really don’t care about my age but I can understand people you do. But you have the ultimate cure right there: focusing on the amazing part of your birthday. Happy birthday youngster! Your friends are always your greatest gift! *laughs* I don’t think that will work for me just yet Mud… 😉 I’ll keep it in mind though! It was my pleasure to give you a gift that brought you pleasure, as knowing you is a gift that has brought me smiles and laughs, sharing moving stories of fiction and parts of our lives , just as we share our 26th year, lol. I wish you a wonderful year full of amazing things. 🙂 As it did for all of us Phil. Thank you for sharing it with me, and for your friendship. 🙂 It means a lot. oh, I just love you! 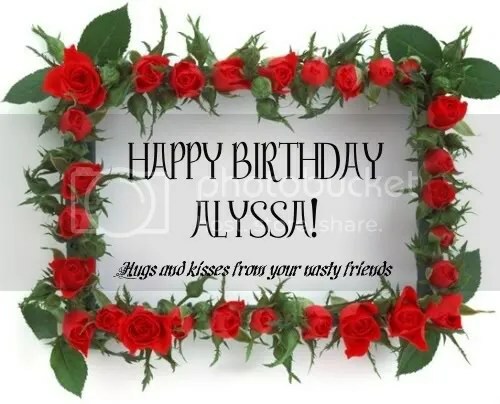 My darling Alyssa, it was my pleasure to give you a gift you so enjoyed.